Scotch® Super 33+™ Vinyl Electrical Tape is a premium grade, flame-retardant all-weather vinyl-insulating tape for cable splices up to 600V. It is designed to perform continuously between a temperature range of 0–220°F (-18–105°C), unlike cheap electrical tape. 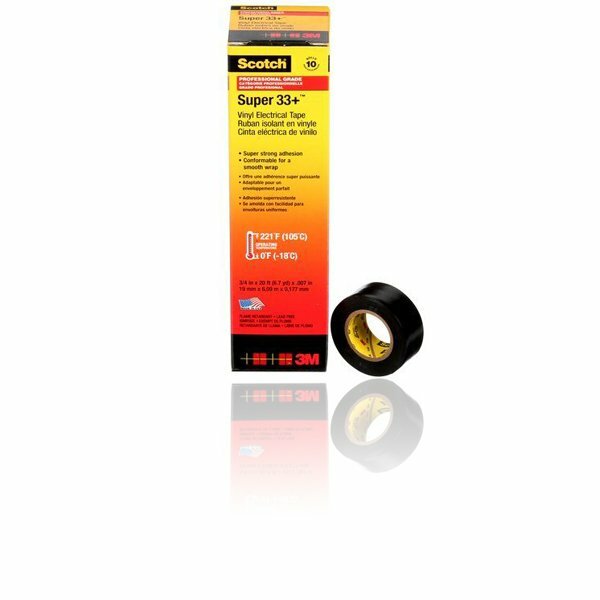 Scotch® Super 33+™ Tape is an abrasion-resistant tape that offers electrical and mechanical protection with the combination of an aggressive, rubber-resin adhesive and an elastic PVC backing. This tape is highly resistant to UV rays, moisture, alkalis, acids, corrosion and varying weather conditions. It is an ideal choice for providing a protective jacket for low- and high-voltage buses, as well as harness cables/wires. This tape is compatible with solid, dielectric cable insulations, rubber and synthetic splicing compounds, as well as epoxy and polyurethane resins. Sold in a retail package with 10 rolls. UL Listed, ASTM Approved, CSA Certified and RoHS 2011/65/EU Compliant.